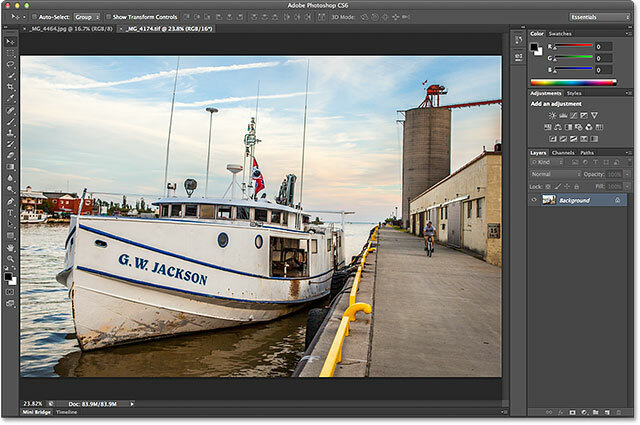 As we've learned so far in previous tutorials, Adobe Camera Raw is a plug-in for Photoshop that was initially designed for processing and editing photos captured in your camera's raw file format. 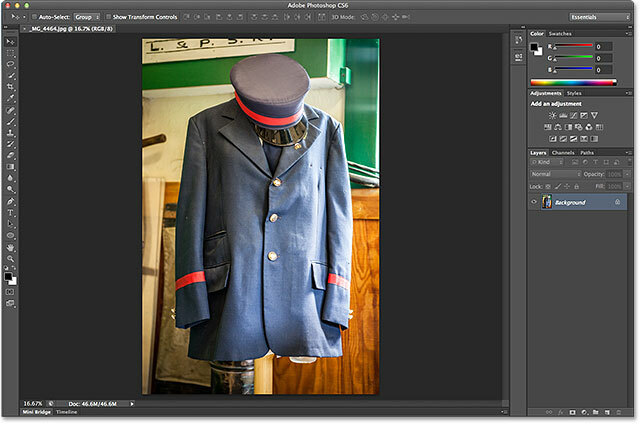 Over time, Adobe added the ability for Camera Raw to edit JPEG and TIFF images as well. 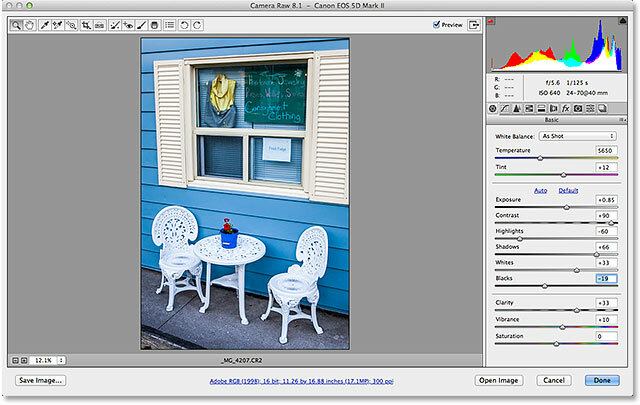 In this tutorial, we'll learn how to open all three file types in Camera Raw. As we'll see, opening raw files in Camera Raw is simple and straightforward (as it should be), yet while that's mostly true for opening JPEG and TIFF files, things can get a little confusing if you're used to opening images simply by double-clicking on them. For that, we'll need to take a look at Camera Raw's Preferences to make sure things are set up the way that best fits your style of working. 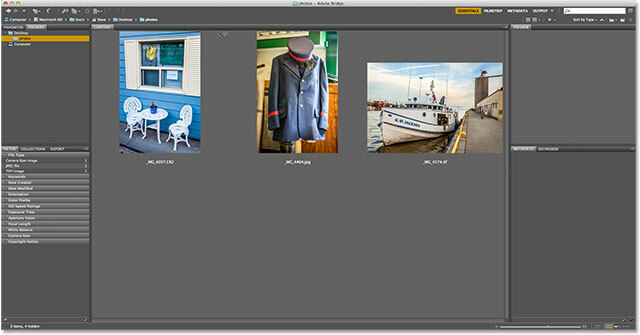 Adobe Bridge (CS6) showing three image thumbnails. Clicking once on the raw file to select it. Method #1: Click the Open in Camera Raw icon. Method #2: Go to File > Open in Camera Raw. 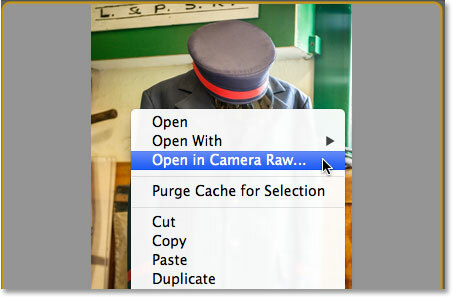 Method #3: Right-click (Win) / Control-click (Mac) on the image thumbnail and choose "Open in Camera Raw". Method #4: Double-click directly on the raw image thumbnail. 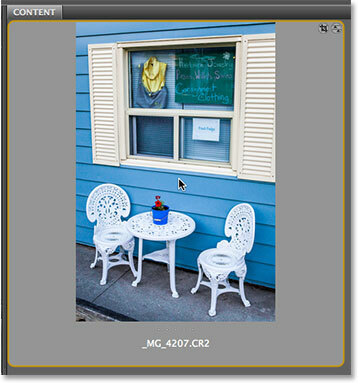 The raw file is now open inside the Camera Raw dialog box. Right-clicking (Win) / Control-clicking (Mac) on the JPEG thumbnail and choosing "Open in Camera Raw". Double-clicking on the JPEG image thumbnail. The JPEG opened in Photoshop, not Camera Raw. Double-clicking on the TIFF image thumbnail. The TIFF image also opened in Photoshop, not Camera Raw. Go to Edit > Preferences (Win) / Adobe Bridge > Preferences (Mac). The JPEG and TIFF Handling options in the Camera Raw Preferences. By default, the JPEG option is set to Automatically open JPEGs with settings, and the TIFF option is set to the similar Automatically open TIFFs with settings. What this means is that a JPEG or TIFF file will only open in Camera Raw (when we double-click on it in Bridge) if we had previously opened and made changes to it in Camera Raw. In other words, if a JPEG or TIFF file has Camera Raw settings already applied to it, Bridge will assume you want to re-open it in Camera Raw for further editing. If no previous Camera Raw settings are found, Bridge will skip Camera Raw and open the image in Photoshop. The default setting for handling JPEG and TIFF files is usually the best choice. The JPEG photo open in Camera Raw. Using the HSL / Grayscale panel to convert the color photo to black and white. 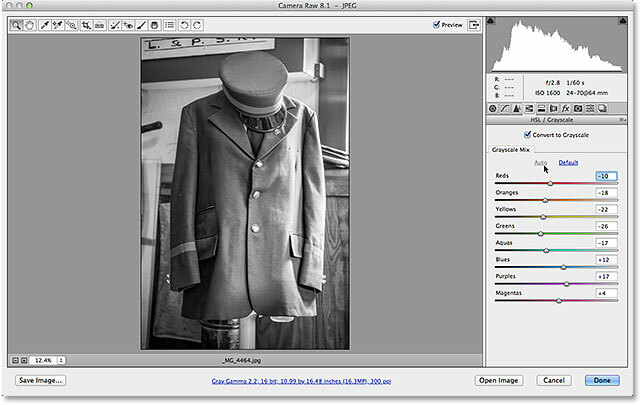 The preview area shows the results of the grayscale conversion. The round slider icon lets us know that the JPEG image has Camera Raw settings applied. The JPEG image automatically re-opened for me in Camera Raw. And there we have it! That's how to open all three supported file types - raw files, JPEGs and TIFFs - in Adobe Camera Raw! Check out our Photo Retouching section for more Photoshop image editing tutorials!